I love that you can really see that distinctive yellow pattern in the wings. 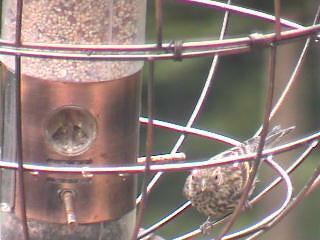 The siskin is such a cool bird, and one that I never imagined would pop up in the birdcam. That must have been a really exciting thing to see. According to noho_bird_club’s comments on the last photo, the bird came back again about five minutes later, and was hopping around on the deck railing, but no one was able to get a shot. kryptonkay reports that she zoomed in on the bird at one point, but that she also was unable to get a shot. Congratulations to everyone who was lucky enough to see the bird, and especially to spurdin and noho_bird_club for getting those great pictures! And my apologies for not even noticing that that happened; I must have been scanning too quickly through the photos that day. I guess I wasn’t bothering to read the IDs. 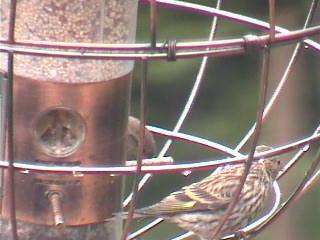 In the thumbnails (or in a wide shot of the feeders, without zooming in) it’s pretty easy to mistake the siskin for a House Finch or a House Sparrow. It just goes to show, you never know what you’re missing if you don’t take the time to look. This entry was posted on Thursday, June 7th, 2007 at 11:32 pm	and is filed under Records and Rarities. You can follow any responses to this entry through the RSS 2.0 feed. You can leave a response, or trackback from your own site. 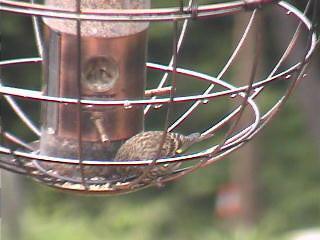 I’am glad you noticed the siskin and I was wondering why you didn’t put him in your blog, now I know. I just thought it was a house sparrow at first so I didn’t really take any pictures and I can kick myself for not doing it. Oh well it’s always exciting to see new birds and find out about them. Have a great day everyone!